Dr. Vahedi shared a vision of the next quarter century of immunology research. Gina Pacella a G&E PhD student joined the lab as a rotation student in April 2019. Welcome Gina! Dr. Wenliang Wang joined the lab as a postdoctoral fellow. Welcome Wenliang! Dr. Vahedi presents lab's work at the Immunology Interest Group at the NIH on March 2019. The video of research talk is available. Dr. Vahedi has been chosen as a finalist for the Burroughs Wellcome Fund in the Pathogenesis of Infectious Disease program in Feb 2019. Our collaboration with the Faryabi lab studying the 3D genome organization of cancer cells got accepted in Molecular Cell in December 2018. Congrats to Faryabi lab in addition to Naomi and Maria! Naomi Goldman, a PhD student in the lab, is the recipient of a T32 award from NIAID. Congrats Naomi! Dr. Vahedi will serve at a NIAID special emphasis panel study section in January 2019. Dr. Vahedi will present lab's work at the Pathology Seminar series at the University of Massachusetts’ Medical School in December 2018. Karun Kiani MD/PhD rotation student in the G&E program joined our lab in Oct 2018. Welcome Guillaume! Dr. Vahedi will present lab's work at the Cell and Developmental Biology Department of University of Michigan in October 2018. Dr. Vahedi will present lab's work at the JCB–JEM Symposium: Tackling Cancer Plasticity and Heterogeneity at the Rockfeller University in October 2018. Dr. Vahedi has been nominated for the Helmholtz Young Investigator Diabetes (HeIDi) Award and will present lab's work at the 6th Helmholtz Diabetes Conference in Munich, Germany in September 2018. Dr. Vahedi will serve as a member of the NIAID/NIH study section for cooperative centers on human immunology in September 2018. Guillaume Harmange PhD rotation student in the G&E program joined our lab in August 2018. Welcome Guillaume! Our novel method for inferring variability of chromatin accessiblity at the single-cell level is accepted for publication! Super awesome news: lab's first R01 scored 2 percentile! Dr. Vahedi presents lab's work at the Multidisciplinary Immunology and Transplantation Interest Conference on May 4th, 2018. Stanley's preprint using cosine similarity to infer variability of chromatin accessibility at the single-cell level is on bioRxiv. Our contribution to the Cold Spring Harb Perspectives Biology also ended up on the cover of the March issue! Benjamin Auerbach PhD rotation student in the GCB program joined our lab in April 2018. Welcome Ben! The TCF-1 paper was highlighted in Nature Immunology in March 2018. Our recent paper was highlighted in Penn News Today. We currently have an open position for a postdoctoral fellow in our lab. The press release for our latest paper is here and picked up by other news media here. On Februrary 20th, 2018, our lab's first paper appeared on the cover of Immunity and we also got a News and Views. Wow! Yeqiao Zhou G&E PhD and Sam McCright IGG MD/PhD rotation students joined our lab in January 2018. Welcome Yeqiao and Sam! A nice end-of-2017 result: Our lab's first research paper got accepted for publication on December 28th, 2017. Congrats to JJ, George, and Stanley! Our contribution to the Cold Spring Harb Perspectives Biology book titled “Immune Memory and Vaccines: Great Debates” is now available at Amazon. Dr. Vahedi presents lab's work at the 4th Annual “Breaking News” ACC-IFI Cancer Immunobiology Retreat on December 21st, 2017. Dr. Vahedi presents lab's work at Penn Derm Research Seminar on December 12th, 2017. Stanley Cai presents his new method called PRISM to assess cell-to-cell variability in single-cell ATAC-seq data at Penn's Single-cell Work Group on Dec 1, 2017. Naomi Goldman IGG PhD student joined our lab after a successful prelim in October 2017. Welcome (back) Naomi. Maria Fasolino and George Georgakilas, postdoctoral fellows, present lab's work at the Epigenetics Institute's Retreat in Citizen's Bank Park, Philadelphia, on October 13th, 2017. John Johnson and Naomi Goldman, IGG PhD students, present lab's work at the Immunology Graduate Group Retreat in Reisterston, MD on October 6th, 2017. September 1st 2017 was an exciting day for the Vahedi lab. Our HiChIP for K27ac in mouse T cells worked beautifully! Thanks Maria, Jelena, Naomi, and Yeqiao! Dr. Vahedi presents lab's work at the 46th Annual Scientific Meeting of the International Society for Experimental Hematology (ISEH) in Frankfurt Germany in August 2017. Maria Fasolino's Preview on NF-kb and chromatin in Immunity is here. Connie Jiang a G&E (formerly called GGR) MD/PhD rotation student joined our lab in August 2017. Welcome Connie! Bejamin Cattau a Haverford graduate joined us as a new research specialist. Welcome Ben! Collaboration with Dr. Joe Zhou's lab (Brian Johnson, Maria Fasolino) and Vahedi lab (George Gerogakilas) was accepted in Nature Medicine in July 2017. Congratulations to everyone! Dr. Vahedi presents lab's work at Federation of American Societies for Experimental Biology (FASEB) in July 2017. Vahedi lab becomes a core member of the Penn Epigenetics Institute, a super exciting group of scientists. Stanley Cai, our former undergraduate student (the only person I know scoring 100% percentile on MCAT), joined the lab as a research specialist. Welcome back Stanley! Naomi Goldman joined the lab as IGG rotation student in June 2017. Welcome Naomi! Dr. Maria Fasolino joined our lab in June 2017. Welcome Maria! Dr. Vahedi presents lab's work at Fox Chase Cancer Center in May 2017. Vahedi and Speck labs are the recipient of At-Large Epigenetics Pilot Grant for the proposal “Uncovering regulatory coordination during T cell development using single-cell epigenomics” in March 2017. Thanks the Penn Epigenetics Institute! Congratulations to IGG rotation students Megan Frederick and Austin Huffman to receive an honorable mention in the National Science Foundation Graduate Research Fellowship. Congratulations to our lab's undergrad student, Stanley Cai, for his contribution in the disease module identification DREAM challenge which will be published in Cell! Megan Frederick and Austin Huffman joined the lab as IGG rotation students in January 2017. Welcome Megan and Austin! Dr. Vahedi was invited to present at the Scientific Program of the Annual Society of Hematology in San Diego in December 2016. John Johnson (IGG PhD Student) started his first rotation in my lab in May 2015. It only took 17 months until he finally joined the lab. Welcome JJ! Steph Sansbury joined the lab as a GGR rotation student in September 2016. Welcome Steph! Dr. George Georgakilias an expert in micro-RNA analysis joined our lab in August 2016. Welcome George! Aaron Chen joined our lab as a research specialist in August 2016. Welcome Aaron! The Vahedi laboratory is the recipient of Discovery Grant from the National Psoriasis Foundation. Dr. Vahedi was invited to a panel at the NIH Career Symposium. Congratulations to IGG rotation students Jacob Paiano and John Johnson. Jacob was awarded the National Science Foundation Graduate Research Fellowship and John Johnson received an honorable mention. Dr. Vahedi received the prestigous Alfred P. Sloan Fellowship in Computational and Evolutionary Molecular Biology in February 2016 (The Penn News announcement). Our super-enhancer study in T cells as the NIH's 2015 Research Highlights. Dr. Vahedi's seminar at the 4th International Conference on Immunotherapy in Pediatric Oncology (CIPO2015) in September 2015 can be watched here. IGG rotation students, John and Jacob, published a commentary in European Jounal of Immunology in October 2015. Dr. Vahedi receives Pfizer's 2015 ASPIRE US Rheumatology and Dermatology competitive research grant award for the proposal “Epigenomic Mapping of Psoriasis”. 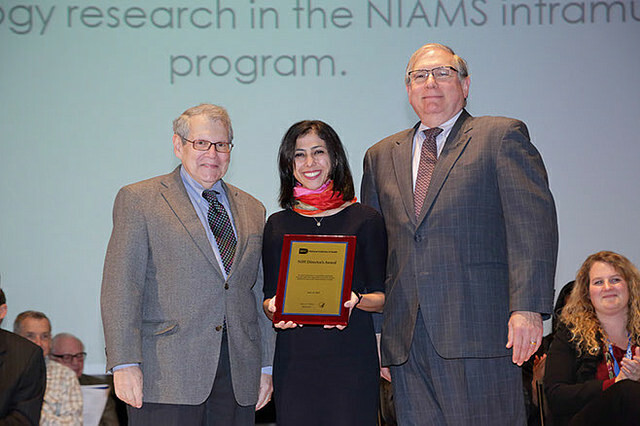 Dr. Vahedi is the recipient of 2015's NIH Director's Award in “recognition of exceptional productivity and scientific contributions to genetic immunology research” in the NIAMS intramural program. Dr. Vahedi's paper linking super-enhancers and autoimmune diseases is discussed at the NIH press release , NIH Research Matters, PHG foundation, Multiple Sclerosis News Today, IBD News Today and Science Daily. High level statistics from Altmetric for the article can be found here. An interview with Dr. Vahedi here. Page generated 2019-04-21 10:30:53 EDT, by jemdoc.